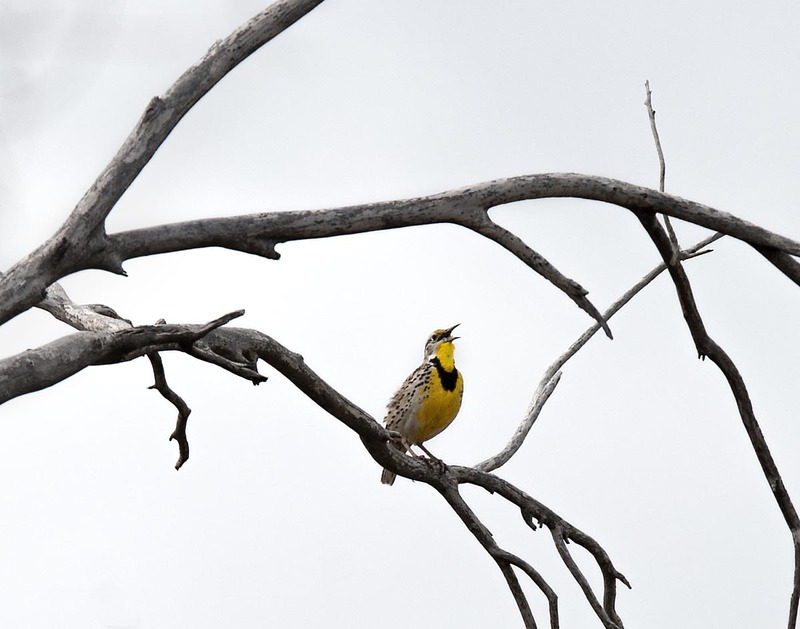 Even on the cloudiest of days a Meadowlark sings it song. Rocky Mountain Arsenal National Wildlife Refuge Denver, CO. They do have that wonderful song. We sometimes listen to a recording of them in the winter to remember spring will come. I love the way his yellow color just pops out against the sky! Hi and thanks for leaving some feedback as we really appreciate it. That lemon yellow on a grey day was quite a contrast. Glad you found it heartening. Have a great weekend. Yes, meadowlarks are lovely to see and hear. It’s been a while since I’ve seen one wearing its yellow golf sweater with the black turtleneck. Hi, well it is still cool out there so the turtle neck is a must have. Hope you are having a great day and have a wonderful weekend. Beautifully captured! That is our Nebraska state bird…LOVE it’s song! Hi Tammy, we only see these guys out on the eastern part of Colorado which at times resembles part stour your wonderful state of Nebraska. A good state bird for sure and easier to photograph than the Lark Bunting of CO. I look at your photographs and wonder how does he capture such perfect moments. Love the contrast of the yellow against the grey, and also the shape of that particular branch. Beautiful! Hi Krystal and thanks for the kind feedback as we really appreciate it. That Yellow is all Meadowlark…such a vibrant and pure yellow it is. Hope your day is going well and you are having a wonderful week so far. One of my favorite birds of all time! Beautiful photo! Hi and thanks, it is one of favorites as well and the song it sings is a photo in it’s own right. Hope your day is going well.